Are you at the point of 'enough is enough' and you are ready to stop smoking? Would you like to improve your financial position and stop your money going up in smoke? Would you like to feel as though you have a choice about how you live your life instead of being at the mercy of the old crutch? Would you like to get rid of the smokescreen of the past and deal with your underlying emotions in a healthier way? There are studies in America that have shown that hypnosis is the most effective method for stopping smoking for good, with an 85% success rate after just one session. 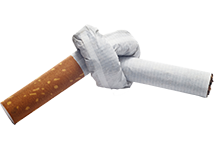 This contrasts to the low rates of 10% success for those using nicotine patches and 6% for will power alone. The reason hypnosis is so successful is because it helps you to use the whole of your mind-both the conscious and subconscious parts working together to enable you to stop smoking permanently and easily. I have stopped hundreds of people from smoking by combining the power of hypnosis with the latest psychological techniques such as NLP (Neuro–Linguistic Programming) and TFT (Thought Field Therapy) to make the process even more effective. Over 60% of people who commit to this programme do so as a result of being referred to me by someone who has stopped! I am also an Accredited Practitioner with the CRSST (Central Register of Stop Smoking Therapists), this is a national body that sets a standard of accreditation and ethics for non-pharmaceutical methods to liberate individuals from the smoking habit.